"I spend my life tuning into thoughts." I've always been a closet nerd about magic and magicians. As a kid I was always saving my pennies to buy some small trick, and as I got older I dabbled in card sleights and forces, and even spent a time studying Corinda's 13 Steps To Mentalism after getting a personal recommendation for this mentalist bible from Teller (the short half of Penn & Teller). The realm of mentalism and doing cold reads (where one appears to know the personal thoughts of a roomful of strangers) is an acquired skill, and when it's done well it is brilliant and can appear supernatural, though it isn't. I grew up watching The Amazing Kreskin on The Tonight Show and The Mike Douglas Show, and during his prime his mentalist act was without a doubt one of the best, though I always grew weary when he tried to imply, as he does here, that it's a "legitimate phenomena" and "for real". Those kind of bold-faced untruths are best left for the spoon-benders of the world. It's supposed to be entertainment. After watching this performance by the well-known, old school mentalist I was struck by how his stage presence has deteriorated over the years, and he has moved his act away from the impressive cold reads into the realm of tired parlor tricks. Recorded in 2004 apparently for television (based on the "Next..." transitional segments between chapters) at the Friars Club in New York City in front of a small audience, Kreskin, who now more than ever seems to have lost the ability to deliver cohesive and logical patter during his act is left to rely on a schmaltzy hypnosis bit and a grade school-level levitation stunt to fill out 90 minutes. He does reveal how some of his bits are performed, even if the ones he chooses to explain most people probably first learned when they were 11, and he sandwiches these revelations in between brief segments where he almost contradicts his actual magician talents as he continues to hint about his "real" ability. When he shows how he uses audience plants ("stooges") to help complete a couple of tricks, it seems to immediately negate the impact of his cold reads, because for all I know everyone in that room was in on the act. I had high hopes for this release, but this particular performance is something of disappointment, because I know that as a mentalist Kreskin has more talent than is displayed here. The quality of his stage act really seems to have diminished, and his reliance on saying "Isn't that wild?" after each soft bit in order to milk applause seems desperate. Overall the set just seems distractingly unpolished, as if Kreskin was making it up as he went. That's not the Kreskin I remember. Image Transfer Review: The modest shot-on-video image has been issued in the original 1.33:1 fullframe aspect ratio, and it generally looks presentable, aside from minor ringing and shimmer evident in some scenes. Colors look fairly natural and bright throughout, though fleshtones look a bit to warm. Audio Transfer Review: Audio is presented in a very basic 2.0 stereo mix, one that provides clear, nearly distortion-free patter by Kreskin and some moderately full music beds during the transitional sequences. There were some instances of minor clipping in spots, however. Nothing flashy, but suitable for the material. Extras Review: The only extras are not found on the disc, but included in the packaging. There's Kreskin's Amazing Pendulum, a silver replica of the one used to answer questions allegedly under its own power, as well as an insert with the chart used to track the mysterious movements of the aforementioned pendulum. The disc itself is cut into 20 chapters. 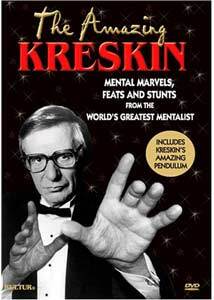 As a fan of magic and mentalism, as well as being a longtime admirer of The Amazing Kreskin, I was troubled by how his act on this disc just seemed so awkward and sloppy, and not a true reflection of the way I remember seeing him at what I guess was his peak. His ability to read an audience is truly a fun thing to watch, but sadly that only merits a small portion of the "feats and stunts" performed here, most of which are pointless bits I learned when I was a kid.